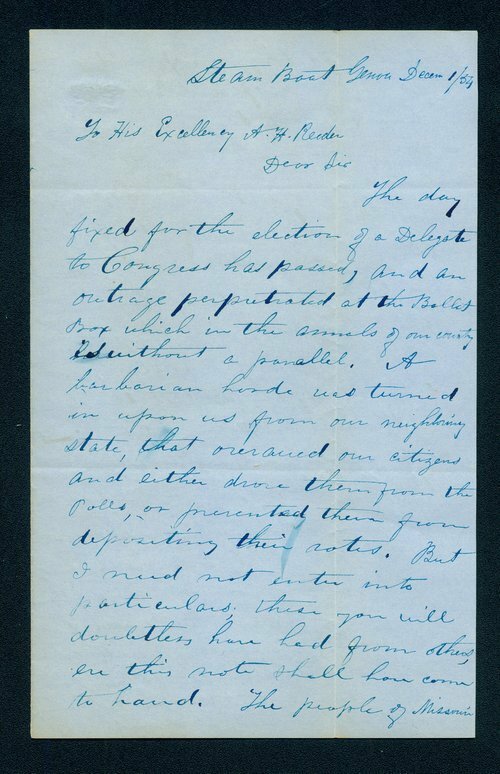 A letter written by Kersey Coates, from the steamboat Genoa, to Kansas Territorial Governor Andrew Horatio Reeder, regarding the bogus Kansas election of November, 1854. Coates expresses his outrage over the number of Missourians who came across the border to vote illegally. He reports that the people of Kansas should support Governor Reeder in his efforts to establish a "home government." A complete transcription is available by clicking "Text Version" below.